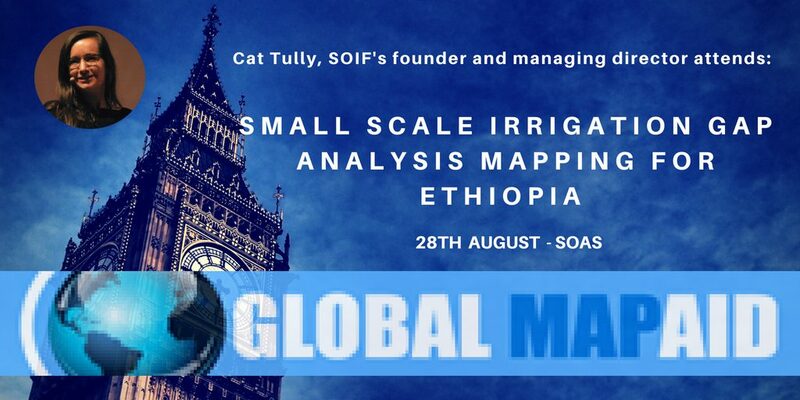 The School of International Futures, represented by its founder and managing director Cat Tully, will attend the lecture “Small Scale Irrigation Gap-Analysis: Mapping for Ethiopia”. The free talk, to be hosted by the Anglo-Ethiopian Society on the 28th of August at SOAS, University of London, will discuss the initiative of Global MapAid and its work in Ethiopia. GMA Chairman, Dr. Rupert Douglas-Bate, connected with SOIF during the conference “Foresight on Africa: be prepared for the future” in 2017. Global MapAid was initiated as a social enterprise to supply specialist maps to key End Users working to alleviate poverty. The enterprise’s objective is to map poverty hotspots by capturing data on gaps and needs that lead to sustainable job creation, such as vocational education, credit and business mentoring. Some of the key End Users include Bilateral Donor, Educator, Finance Sector Organisations, including Micro-credit agencies, Foundation, Government, local and national and more. GMA has the mission of partnering with local organisations and to train, develop and empower local teams so that they can take over mapping needs for their own areas. Its core skill team consist of experts in the following areas: Humanitarian Respons, Geographic Information Systems (GIS, International Development, Surveys and Statistic, Communication, Business Development and Project Evaluation and Strategy. The team works together to ensure that healthy cross-fertilisation of ideas, skills, enthusiasm and innovation can occur to benefit End Users and Beneficiaries. To date, GMA has mapped New Orleans, Haiti, Pakistan, United Kingdom, among others. Its Ethiopia initiative is being carried out in partnership with North-South Consulting, with input from the Ethiopian Women’s Exporters Association, with the aim to help reduce poverty by mapping agro credit, which is vital for irrigation. With a population of 94 million people, Ethiopia is the second most populous country in Africa and it is highly depended on cultural agriculture. This is evidenced as agriculture is the main engine of the economy, accounting for over 40% of gross domestic product (GDP), 60% of exports, and 80% of total employment. However, lack of rainfall is an ongoing concern in Ethiopia, and the country is currently facing what may be the worst drought in 30 years. Through its agro credit map which is vital for irrigation, GMA aims to relieve the crisis and, therefore, reduce poverty. The maps will enable everyone, especially the aid sector, to see what is happening so that thoughtful feedback loops can occur and irrigation support can go to the farmers that need it most. More information on GMA’s Ethiopia Map will be discussed in Mapping Investment in Small-scale Irrigation on the 28th of August.